We did not have much contact with your team, but they were very prompt and friendly! We loved it. It was a gorgeous house in a great location that was just the right size and fit for us, and I really appreciate the family-friendly touches. The kids' toys and games, including beach toys, made it very family friendly; it was so nice not to have to bring our own! And the many windows made for a beautiful, light-filled home. My husband and I have stayed in rain or shine 3 years in a row and we love this house! Not only is the location just perfect it is so comfortable and feels like home. The fenced yard is also a big bonus since we have young children. We have always had a positive experience dealing with your members. Wonderful house with great location. Very clean and well appointed. Always love my time staying at Treasure by the Sea! Had limited interaction with the members of your team. We loved the home!! It was nice to have 4 bedrooms with comfortable king size beds and their own bathroom. The kitchen was stocked with everything we would need. The furniture in the home was clean, comfortable and in great condition. The fenced front yard worked out great for the young children in our group. The bicycles were great for exploring the city. The extra refrigerator in the basement garage allowed for use to freeze all the fish and crab we caught during our visit. I can not say enough about this wonderful home. Thank you for letting us rent in for a few day. We made some great memories. Everything was very straight forward and concise in written correspondence. I did not get my door code e-mail 3 days prior to stay but I e-mailed and called and was responded to quickly. Likely the e-mail was lost in spam or something on my end. Enjoyed the clean, nice home. Maybe a few more towel bars and coat hooks. Views, plenty of room for our group. Enjoyed the outdoor decks! This property was lovely and comfortable. It's not easy to find a 5 br house! A few comments: really need new can opener, the two there are both bad. The master bath door needs slider fixes, also repair person for fridge water/ice dispenser never came. Team members were knowledgeable and courteous and happy to make some accommodations to handle our arrival time. Great location, comfortable home, very positive experience. Love the proximity to the beach and the DVD collection was great for kids. Also appreciated the Netflix access. Danielle always has been very helpful to us. She found this home for us when our previous favorite house became unavailable. Janet is great at handling things and is very professional. 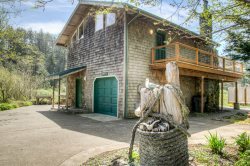 We always look forward to staying in Manzanita, and Beach Cabin is a great fit for us, especially since our kids are growing up and need more room. Didn't have to work with anyone; it was THAT good.